Yesterday I was one of the judges at the semi-finals of the Philips Innovation Award. It was a fantastic event with enormous amounts of entrepreneurial energy. But of course the big question is: how buzzable were the propositions ? In a nutshell my observations on 8 inspiring new business ideas. If you want to connect with these entrepreneurs, let me know and I’ll hook you up. If you have ideas on increasing the buzzability of these concepts, share your comment ! Sun Maliya solar panel ecosystem (finalist). Supply solar energy to people living in conflict areas. What I like is the fact that as a consumer you can basically order your power station to come to you. Your family, friends in wealthier countries will pay the power bill per week/month. What would make it even more buzzable is if local entrepreneurs could become the people paying for the panels and exploiting them. Then you get a truly sustainable business model by creating a local economic model. Dabirdy EV charger (finalist). Smart usage of high voltage tram lines to create more efficient fast chargers for electric cars. 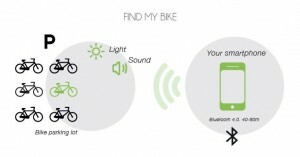 Buzzable because you are leveraging existing stuff: electricity and locations. People like elegant solutions and understandable low tech. The founders want to turn the charger into a visible, fun object like a tree tapping fuel (water) from the tram lines. If they go more extreme, you could turn charging your car into an experience, like ToTheLoo has done for toilet visits. If you spend 25 minutes charging, why not create a fun experience in that time ? 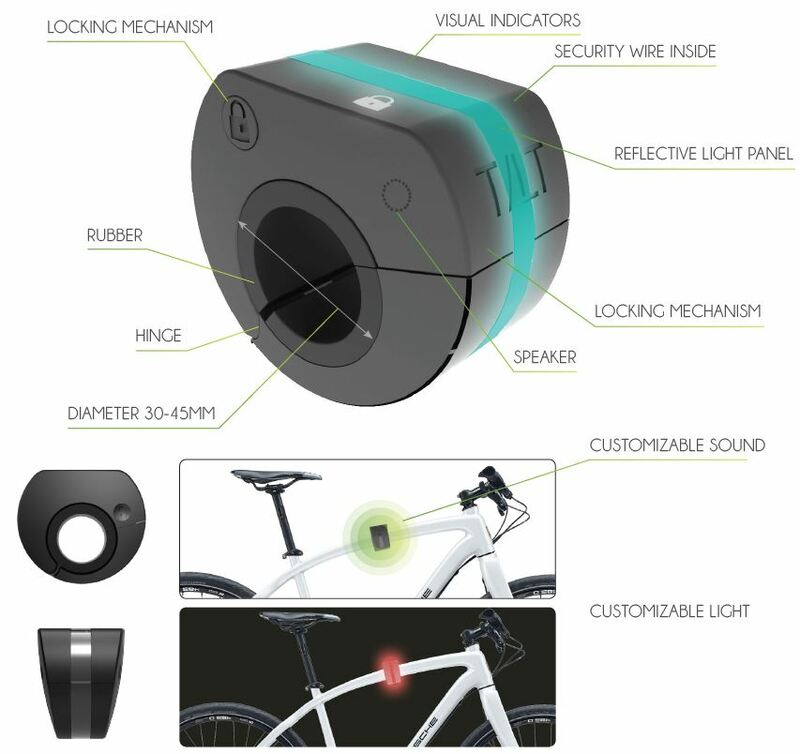 TiLT Bike locator/protector. Find your bike using an app and get notified when it is moved/stolen. At first glance, these guys will find it difficult to compete with the likes of Tile. But they have a few aces up their sleaves: their product cannot be removed without alarm and they are thinking about making their product more versatile, suitable for more occasions/objects. And the fact that you can customize the sound and light effects (like a ring tone) is a nice buzzable touch. Dwillo mentorship matching platform (finalist). In our times, you’ve got to have a coach or mentor to survive. Dwillo focuses on creating thee match between mentor/mentee for the group that needs a mentor most: students about to make career choices. That by itself is a pretty buzzable proposition. Their matching algorithm gives it a nice ‘tech/Amazon-smartness’ edge. To make it more remarkable sooner, they could start with a freemium model and target corporate customers once they have some scale. 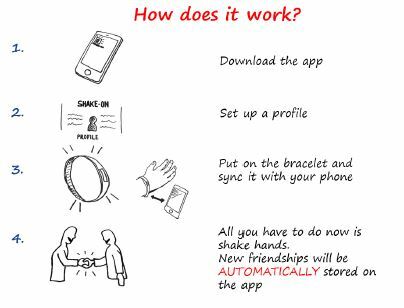 Shake On networking bracelet (finalist). You might think: not another app or wearable piece of tech that aims to replace the business card. But the buzzability lies in the focus on events (where do you meet most new people ?) and the intuitive link to a very human gesture: shaking hands. What could make it more remarkable ? A Shake might trigger your memo recorder app or camera on your smartphone so that you can add verbal, visual context to the encounter. 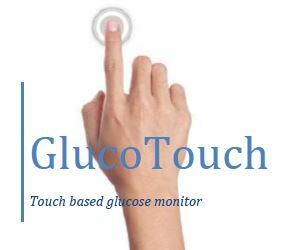 GlucoTouch glucose monitor (finalist). Monitoring your glucose levels as a diabetes is (literally) a pain. Making that a painless, easy and cheap process is a highly buzzable solution for an ever growing group of people. A great buzzability enhancer would link its glucose monitoring data to ‘life-monitoring’ apps (movement, diet, health signs) such as Jawbone’s Up https://jawbone.com/up and and create intelligent big data that will help solve the problem. Another way to create buzz that they ar thinking of: create awareness of diabetes by monitoring in public places.